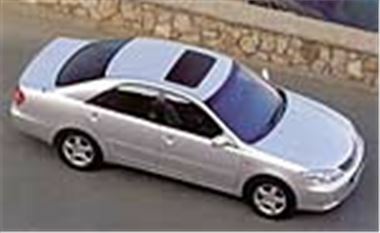 The new 2002 model Toyota Camry is now in sale in the UK at prices from £19,495 to £27,495. It has a choice of two engines. The smaller is a new 2.4 litre VVTi which develops 150bhp at 5,600rpm and 161 lb ft (218Nm) torque at 3,800 to 4,200rpm. The manual gets to sixty in 9.1 seconds, goes on to 130mph, delivers an excellent 32.8mpg in the combined cycle and emits 206g/km CO2. The 2.4 four-speed automatic does the sixty dash in 10.2 seconds, reaches 124mph, sips petrol at the rate of 29.2mpg on the combined cycle and emits 233g/km CO2. The alternative engine is a 3.0 litre V6 which pumps out 184bhp at 5,300rpm and 201 lb ft (273Nm) torque at 4,300rmp. Four-speed auto only, it gets to sixty in 8.9 seconds, runs to 140mph, gives you 25.7 miles per gallon on the combined cycle and emits 263g/km CO2. Maximum braked towing weight of all models is 1,600kg. External dimensions are: length: 4,815mm, width: 1,795mm, height 1,500mm. Boot capacity is a big 587 litres.